Fuel spill clean-up efforts continues nearly two months after spill. Clean-up efforts continue after the massive fuel spill on Highway 401 near Cambridge nearly two months ago. 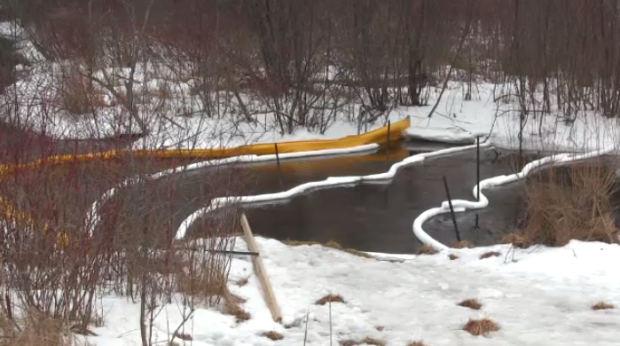 On Jan. 13, a tanker carrying about 50,000 litres of jet fuel flipped between Townline Road and Highway 6 South, spilling fuel onto the surrounding area and into nearby waterways. The Ministry of the Environment is continuing to monitor the clean-up efforts to ensure the owners of the spilled fuel know their responsibilities and to make sure the environmental impacts are dealt with properly. According to government officials, there haven’t been any impacts found in the Grand River or to local drinking water and there is no first-hand evidence of impacted wildlife at this point. “As of March 7, 2019, water and soil impacted by the jet fuel spill has been delineated at the immediate spill location. Remediation of surface water and soil are ongoing,” says the MOE in an email. Crews are monitoring shorelines of Aberfoyle Creek, Mill Creek, and Shades Mill daily, and surface water samples upstream and downstream of the spill site are being collected.